(2012.088.45, Lewis A. Danner Collection, OHS). Created at 1907 statehood, Marshall County is in south-central Oklahoma, with Johnston County on the north, Bryan on the east, Love and Carter on the west, and the state of Texas on the south. The county name honors the maiden name of George Henshaw's mother. Henshaw, a Madill native, served in the 1906 Oklahoma Constitutional Convention. The county contains 426.95 square miles of land and water area. The incorporated towns are Kingston, Madill (the county seat), and Oakland. The county lies in the Coastal Plain physiographic region, accounting for its rolling prairies. There are also intermittent deposits of limestone. The Red River Basin drains the county. In 1944 the U.S. Army Corps of Engineers completed the Denison Dam, impounding the Red and Washita rivers, creating Lake Texoma, and inundating a large amount of Marshall County's land. The lake not only forms the county's southern border, but it also comprises the eastern border, which had been the Washita River. A large number of archaeological sites have been investigated in the county. At the beginning of the twentieth century twenty-three Paleo-Indian (prior to 6000 B.C. ), sixty-five Archaic (6000 B.C. to A.D. 1), six Woodland (A.D. 1 to 1000), and twenty Plains Village (A.D. 1000 to 1500) sites were recorded. The Haley's Point Site is an important setting of an Archaic village near the confluence of the Washita and Red rivers. Early Spanish and French explorers and traders in the region contributed little to the historic record. The Great Spanish Road extended into the present county, following the Red River east to the Washita River. After the United States acquired Louisiana Territory, which included present Oklahoma, from the French in 1803, American explorers traversed the area. In 1834 the Dodge-Leavenworth Expedition negotiated peace with Plains tribes. After 1837 the Chickasaw began relocating to Indian Territory, joining the Choctaw. In 1842, to protect Chickasaw settlers in the area, the U.S. Army established Fort Washita on the Washita River's east side in present Bryan County. In 1855 the Chickasaw separated from the Choctaw Nation, creating their own government, with present Marshall County a part of the Chickasaw Nation's Pickens County. In 1859 the Burney Institute for Girls opened near Lebanon, and in 1860 it received a post office designated Burney Academy. After the Civil War it was known as the Lebanon Orphan Institute. In 1887 the institute became the Chickasaw Orphan Home and Manual Labor School. Since statehood the property has been in private hands. The region has historically been a transportation corridor. During the nineteenth century the Texas Road followed the east side of the Washita River in present Bryan County. In 1900–1901 the St. Louis, Oklahoma and Southern Railway (acquired by the St. Louis and San Francisco Railway, known as the Frisco, in 1901) constructed a north-south line through the present county. In 1901–03 the Arkansas and Choctaw Railway (changed to the St. Louis, San Francisco and New Orleans Railroad in 1901 and sold to the Frisco in 1907) laid tracks from east to west through the area. In 1941 the State of Oklahoma constructed tracks to replace the Frisco lines that were to be inundated by Lake Texoma. In 1898 the Curtis Act stripped the Chickasaw government of its power. The allotment process soon provided for individual land ownership, providing a push for Oklahoma statehood, which occurred in 1907. In July 1908 county residents voted Madill the county seat over Kingston. In 1914 Marshall County built its courthouse (listed in the National Register of Historic Places, NR 84003154). Until petroleum was discovered in the early twentieth century, agriculture was the principal income-producing pursuit. Ranching has played a key role in the region's economy. Prior to allotment, early prominent cattlemen included George Holford, William and Dorsey Taliaferro, James Hamilton Willis, and Richard Wiggs. In 1907 the county contained 8,333 cattle and milk cows, a number that increased to 18,631 in 1935. By 1963 ranchers ran 32,000 head of cattle. In 2000 the total of milk cows and cattle was twenty thousand. Farming in the Red and Washita river valleys also contributed to the area's prosperity. In 1907 cotton (36,449 acres) and corn (34,035 acres) dominated. In 1934 most of the 1,476 farms still planted cotton (20,671 acres), with corn (18,508) and oats (14,589) second and third. By 1963 farmers had lost valuable land to Lake Texoma and therefore diversified their production. That year oats (6,900 acres), cotton (2,200), and peanuts (2,180) were the three most-planted products, and farmers cultivated only 350 acres of corn. In 2001 wheat (5,000 acres) occupied the most land, followed by rye (1,900), oats (1,800), and peanuts (1,300). Soon after statehood commercial production of oil and gas began. The Madill Pool generated 540 barrels of oil daily in 1929. The Enos Gas Field near Kingston attracted a number of early drillers. In 1940 the Pure Oil Company established an oil camp that at its peak comprised forty-three houses and a thirty-five-bed bunkhouse. The camp and a nearby Warren Petroleum gas plant supported the town of Little City, originally named Pure City. The camp and town suffered damage from a 1957 tornado, and although the people rebuilt the two, the Pure Oil Company closed the camp in 1959. In 1975 county wells produced 858,675 barrels of oil and 5,849,037 million cubic feet (mcf) of natural gas. In 2000 production comprised 170,582 barrels of oil and 3,993,760 mcf. Local limestone (404,310 tons in 2002) and sand and gravel (2,587 tons) have also been commercially extracted. Nonagricultural pursuits have also contributed income. From 1916 until 1925 the Aylesworth State Prison Farm housed African American inmates. They farmed 1,664 acres in an attempt to create a self-sustaining facility. After it closed, the state divided the land and sold small farms. The county had several sawmills and lumber companies. A notable one was the Madill Lumber Company, formerly the Rierdon Oil and Lumber Company, which in the 1950s began manufacturing wood products as the Lampe Manufacturing Company. In 1964 the county constructed a hospital in Madill, and in 1998 the community leased it to Integris Health, creating the Integris Marshall Memorial Hospital. In 1996 eighteen manufacturing establishments employed 920 workers. At the beginning of the twenty-first century several livestock trailer manufactures were based at Madill, annually producing sixteen thousand trailers. Recreation and tourism at Lake Texoma are significant contributors to the county's economy. A number of resorts, including the Lake Texoma State Park and state-owned lodge, attract outdoor enthusiasts. Kingston hosts an annual Striper Festival, and Madill sponsors the National Sand Bass Festival. U.S. Highways 177 and 377 run north-south in the county, and U.S. Highway 70 travels east-west. State Highways include 70A, 70B, 70F, 99, 99C, and 199. At the end of the twentieth century the Burlington Northern and Santa Fe served as the only rail line. In 2000 three county properties were listed in the National Register of Historic Places. These were the Haley's Point Archaeological Site (NR 91000613), Marshall County Courthouse (NR 84003154), and the Worth Hotel (NR 85000846), with the latter two located in Madill. Oklahoma Gov. Raymond Gary, born near Madill, hailed from Marshall County. In 1907 the newly organized county had 13,144 residents. In 1920 the population stood at 14,674, but drought, a decline in the cotton industry, and the Great Depression stunted growth. The population was 11,026 in 1930 and 12,384 in 1940. The rural-to-urban shift after World War II and the large reduction in land due to Lake Texoma further initiated a decline. In 1950 it registered 8,177 and fell to 7,263 in 1960. By 1980 the population had rebounded to 10,550, increasing to 10,829 in 1990 and to 13,184 in 2000. In 2010 Marshall County registered an increase to 15,840, with 73.8 percent white, 9.7 percent American Indian, 1.5 percent African American, and 0.2 percent Asian. Hispanic ethnicity was identified at 14.0 percent. 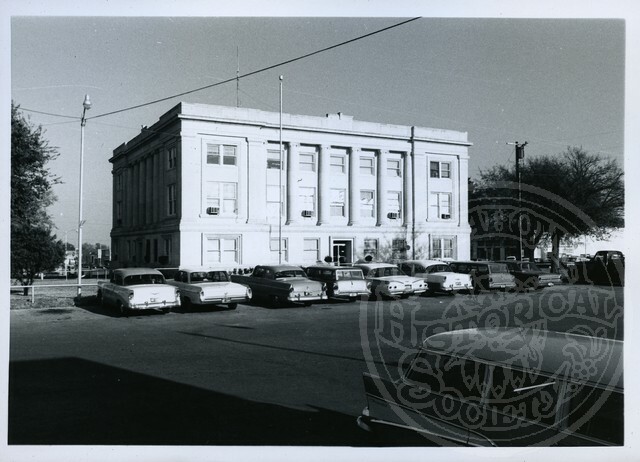 Madill City Library Committee, Memories of Marshall County, Oklahoma: Then and Now (Dallas, Tex. : Curtis Media Corp., 1988). Madill (Oklahoma) Record, Historical Edition, 11 September 1952. Marshall County Genealogical and Historical Society, Marshall County, Oklahoma: One Hundred Years of Celebration (Virginia Beach, Va.: Donning Co., 2007). Ettie Gibson Willis, "History of Marshall County Prior to Statehood" (M.A. thesis, Oklahoma A&M College, 1938). Larry O'Dell, "Marshall County," The Encyclopedia of Oklahoma History and Culture, https://www.okhistory.org/publications/enc/entry.php?entry=MA030.